A 73-year-old man presented to our outpatient radiology office for evaluation of abdominal bloating and distention for the past one year. He reported the discomfort was made worse with eating food. Pertinent medical history included prior cholecystectomy with evidence of healed midline abdominal incision, as well as a history of thyroid cancer. Due to his surgical history and presenting symptoms, there was concern for partial bowel obstruction secondary to incisional hernia. A computed tomography (CT) scan with oral and IV contrast, and delayed images at the kidneys and urinary bladder was ordered for further evaluation. 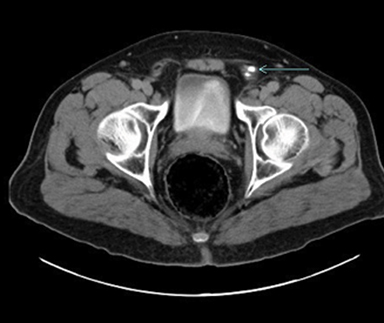 CT revealed an unusual enhancing structure in the left pelvis and left inguinal region. Further evaluation and tracking of the object revealed it to be the left ureter extending into the inguinal canal. The course of the ureter appeared to extend into the inguinal canal, make a sharp turn approximately mid canal, and then to travel rostrally, where it eventually entered the bladder. Additionally, there appeared to be no hernia sac extending into the inguinal canal. There appeared to be no evidence of hydronephrosis or proximal ureter dilation, indicating no signs of obstruction despite the winding path of the ureter (Figures 1-5). The patient denied urinary frequency, dysuria, hematuria, or any other genitourinary complaints. 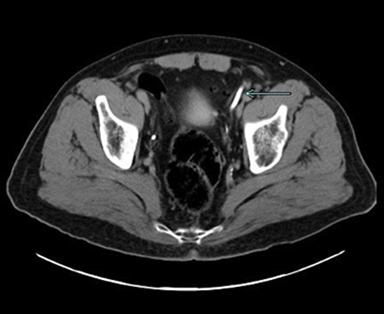 Imaging and history indicated this patient’s extension of the ureter into the inguinal canal to be entirely asymptomatic. Inguinal herniation of the ureter is a rare complication of inguinal hernias, with only about 140 cases reported as of 2009. Ureteral herniation is more often due to an indirect inguinal hernia (80% of cases) rather than a direct inguinal hernia (20%). Additionally, ureteral herniation is classified into two variants, paraperitoneal (80% of cases) and extraperitoneal (20% of cases).1 Patients typically remain asymptomatic and evidence of ureteral herniation is often found incidentally. Extraperitoneal inguinal herniation of the ureter, as seen in our patient, is rarer than the paraperitoneal classification. It is believed to be a congenital malformation, caused by failure of the ureter to separate from the mesonephric duct during development. 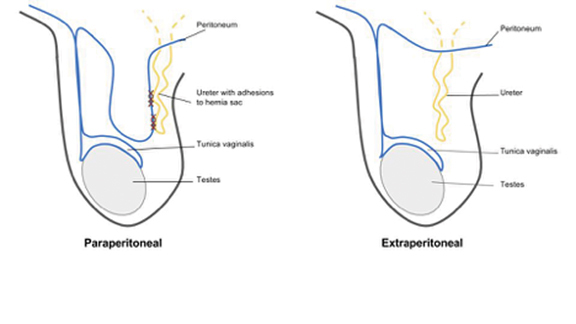 This results in the ureter being pulled along with the testis as it descends into the scrotum.3 Adhesions to the peritoneum do not develop, so extraperitoneal ureter hernias are not associated with a hernia sac (Figure 6). 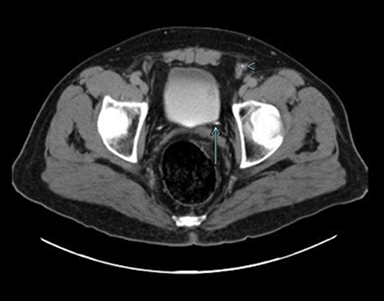 Since it originates from a congenital malformation, extraperitoneal ureter hernias have also been found to be associated with other genitourinary abnormalities such as crossed renal ectopia and nephroptosis.4 Evidence of either of these findings should prompt immediate investigation into the presence of ureteral herniation, due to their close association. Surgical correction of ureteral herniation is indicated if the physician is fortunate enough to make the diagnosis prior to the intraoperative period. In cases of obstructive uropathy, physicians typically opt for percutaneous nephrostomy tube placement in order to normalize creatinine levels prior to surgical correction.6,8 Ureteral stent placement prior to surgical correction has also been recommended, in order to facilitate easy reduction and minimize damage to the ureter.1 Some cases require only simple hernia reduction with repair, taking extra care to not damage the incarcerated ureter.8 Some surgeons, due to the redundancy of the ureter or presence of strangulation, opted for resection of the ureter with anastomosis or reimplantation into the bladder.6,9,10 Patients typically show a good response to treatment when identification of ureteral involvement is made prior to surgical repair. 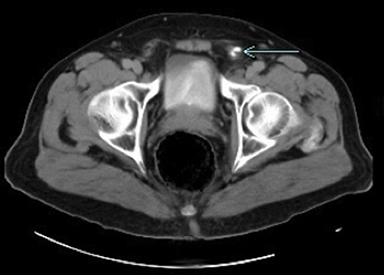 Inguinal herniation of the ureter is a rare, typically asymptomatic, urological finding that is often diagnosed incidentally via radiological evaluation of unrelated symptomatology, or intraoperatively during surgical inguinal hernia repair. With our case, extraperitoneal inguinal herniation of the ureter was diagnosed incidentally in a man presenting to our outpatient radiology office for evaluation of possible bowel obstruction. Inguinal herniation of the ureter is classified as either paraperitoneal or extraperitoneal, with extraperitoneal being slightly less common. Patients are typically asymptomatic and live with this condition for years, but can present with findings of unilateral obstructive uropathy in rare instances. Diagnosis is typically incidental via radiographic studies or direct observation intraoperatively during inguinal hernia repair. Treatment options range greatly from observation to surgical correction with resection and reattachment of the ureter. Better awareness of this uncommon condition is important to help prevent serious surgical complications during inguinal hernia repair. Yahya Z, Al-Habbal Y, Hassen S. Ureteral inguinal hernia: An uncommon trap for general surgeons. BMJ Case Reports, [Epub ahead of print]; Aug. 2017, doi:10.1136/bcr-2017-219288. Ghielmini E, Julita E, Cerantola Y, et al. Inguinal bladder hernia with acute ureteral obstruction 14 years after kidney transplantation: A case report. Transplantation Proceedings. 2017;49(7):1593-1595. doi:10.1016/j.transproceed.2017.04.003. Falidas E, Gourgiotis S, Veloudis G, et al. Asymptomatic extraperitoneal inguinoscrotal hernia involving ureter: A case presentation and review of the literature. J Nat Sci, Biol, Med. 2015;6(3):153-155. doi:10.4103/0976-9668.166126. Berger D. Evidence-Based Hernia Treatment in Adults. Deutsches Ärzteblatt International. 2016;113(9):150-158. doi:10.3238/arztebl.2016.0150. Otani L, Jayanthi S, Chiarantano R, et al. Sonographic Diagnosis of a Ureteral Inguinal Hernia in a Renal Transplant. J Ultras Med. 2008;27(12):1759-1765. doi:10.7863/jum.2008.27.12.1759. Nicolò P, Aleo D, Ricciolo E, et al. Case 230: Congenital Inguinal Herniation of the Left Ureter (Extraperitoneal Form). Radiology. 2016;279(3):972-977. doi:10.1148/radiol.16141805. Mckay J, Organ M, Bagnell S, et al. Inguinoscrotal hernias involving urologic organs: A case series. Can Urol Assoc J. 2014;8(5-6);429-432. doi:10.5489/cuaj.225. Sanchez A, Trebar J, Martin M, et al. Obstructive Uropathy Secondary to Ureteral Herniation in a Pediatric En Bloc Renal Graft. Am J Transplan. 2005;5(8):2074-2077. doi:10.1111/j.1600-6143.2005.00973.x. Epps JC, Close TP. Extraperitoneal herniation of the ureter. Appl Radiol. 2019;48(2):44-45. Prepared by Mr. Epps while a third-year medical student at the University of South Carolina School of Medicine, Columbia, SC, and Dr. Close while a Vascular and Interventional Radiologist, Image Care LLC, Columbia, SC.